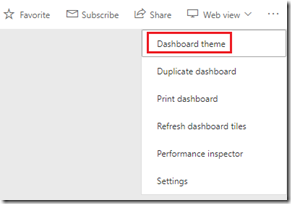 Today, I am thrilled to announce the availability of dashboard theming in the Power BI service. 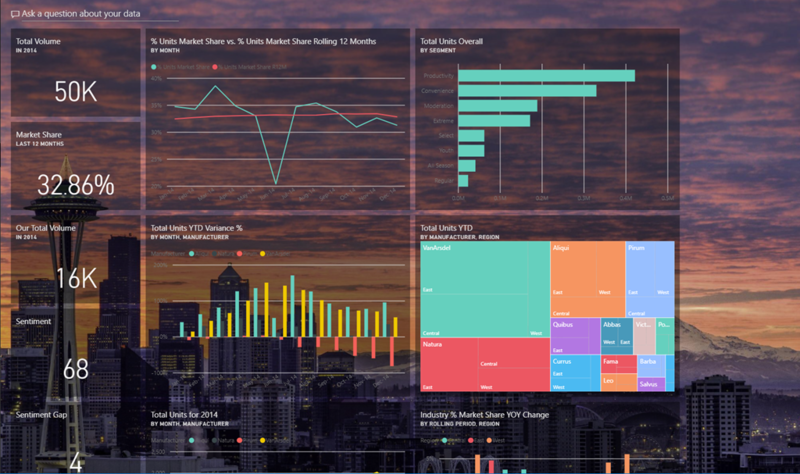 Power BI dashboards pull together reports, images, Excel workbooks, and more, to provide a 360-degree view of your organization in a single pane of glass. Now, you can quickly style your pane of glass to match a theme or your corporate branding with just a few clicks! Excited? Read on more details. Or, put on your Picasso hat and head directly to your favorite dashboard to start theming it on your own. To get started, open a dashboard that you want to customize, and click on the “Dashboard theme” button in the ellipses at the top right. Note: You will need to be an author of the dashboard to see this option. In the dashboard pane that appears, you will see a drop-down with four choices: built-in themes (Light, Dark, Color-blind friendly) or a custom option. Selecting the built-in themes will automatically preview your existing dashboard with the selection. The colors chosen for these themes based on the theming standards and visual that provide the best contrast. The default and existing theme for Power BI is Light. 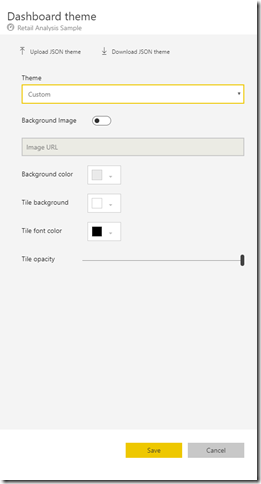 If you want to customize the colors or create your own theme, select custom in the drop-down. The pane should now populate with more options to configure the background, tiles, and fonts for the dashboard. Note: If you want to add a background image, you need to specify an URL. We recommend that your image is at least 1920×1080 resolution to cater all the screen sizes of your viewers. Lastly, if you prefer doing all this programmatically, you can upload a theme file using the Upload JSON theme button on top of the pane. A theme file is a JSON file that includes all the colors you want use for your dashboard. Most of you might be already familiar with the JSON file for report themes; this essentially mirrors that structure. Yes, you can use an existing JSON file that you have for reports and upload it to change the chart colors on the dashboard. 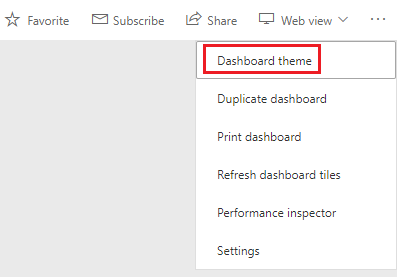 If you need some inspiration, check out the theme gallery page in the Power BI Community to where you can find new themes that users have shared. Tip: You can use the JSON file to share your dashboard theme with other authors or create a template for your organization. 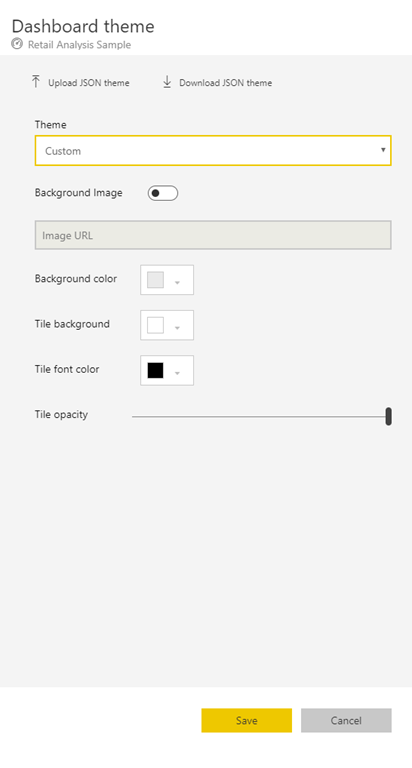 Like the built-in and custom options, when the theme is uploaded, the colors will automatically be applied to all tiles on the dashboard. Changing the colors of the report visuals on the dashboard will not affect the visuals in the report. Also, when you pin tiles from reports and choose destination theme, the dashboard theme will persist and override the report visual colors. Current limitations: Dashboard themes are currently not supported when viewing the dashboard embedded using the REST API, on mobile devices, or by external users. We are working to light op these capabilities across all fronts soon. Registrera dig nedan och få de senaste nyheterna om Power BI direkt i din inkorg! När du klickar på Registrera dig redan idag samtycker du till att Microsoft via nyhetsbrevet om Power BI ger dig exklusiva nyheter, undersökningar, tips, råd och annan information som gör att du får ut mesta möjliga av Power BI. Du kan avsluta prenumerationen när som helst. Microsofts sekretesspolicy.